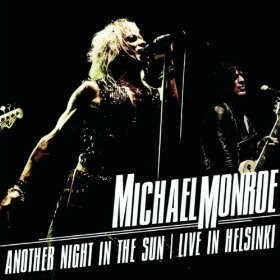 This live album from the fab Finn was recorded on his home turf in Helsinki earlier this year. His band includes Wildhearts’ Ginger and Steve Conte of The New York Dolls on guitar, ex-Hanoi Rocks’ Sammy Yaffa on bass and ex-Danzig drummer Karl Rosqvist. It’s a strong line-up and from the hip shaking opener ‘Nothin’s Alright’ you know you’re in safe hands. What you want from a live album is for it to emulate the feeling of actually being at the gig. 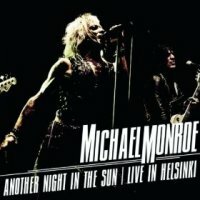 Monroe’s exuberance, undimmed despite thirty years treading the boards, bursts out the speakers and ably demonstrates why he’s still a hot ticket. This is a good mix of tracks that cover his career. ‘Motorvatin’, the Bo Diddly groove of ‘Back To Mystery City’ and the rollicking ‘The Boulevard of Broken Dreams’ are some of the Hanoi Rocks highlights. The nostalgic singalong ‘Hammersmith Palais’, the snotty ‘Dysfunctional’ and the ace Johnny Thunders cover of ‘I Wanna Be Loved’ are welcome additions from his Demolition 23 days, and there’s a spirited cover of the Damned’s ‘Machine Gun Etiquette’. There are a couple of new songs, the rocking ‘Motorheaded For A Fall’ and ‘You’re Next’ that indicate what this band are likely to come up with when they hit the studio later this year. Monroe’s punky take on rock ‘n’ roll sounds as potent today as it did when he first teased his hair and added eyeliner back in ’79. Always more successful on the live circuit than he was shifting CDs, this gig is a loose and limber live retrospective that demonstrates why he’s one of rock ‘n’ roll’s great survivors.